We normally remind our podcast listeners that feedback about our episodes, which we value highly, can be sent by visiting the page: grc.com/feedback. But amid all the news and content of this very special episode, I don't think that was said. So please accept this reminder in the event that you wish to . . . feed back. Thanks! for the SBC6120 single-board computer. 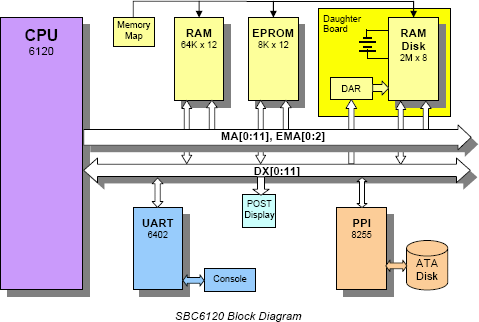 The SBC6120 single-board computer kits are made possible not only thanks to Bob Armstrong's peerless design work, but also by the extremely limited availability of the long-since-discontinued Harris HD6120 PDP-8 on-a-chip. The one page brochure for Bob's SBC6120 single board PDP-8 kit. The one page brochure for Bob's FP6120 front panel kit. Thanks to a brief miracle of availability of the HD6120 PDP-8 on-a-chip, this SBC6120 single-board PDP-8 kit is again available, in limited supply. When the SBC6120 kits are gone, they will almost certainly never be available again since they depend entirely upon a unique PDP-8 on-a-chip that has not been manufactured for many years. The fantastic FP6120 Front Panel kit will ONLY BE RECREATED IF there is sufficient interest from hobbyists who want the SBC6120 kit and also express an interest in the optional front panel kit. Bob says that he would need at least 100 solid commitments for the front panel for it to be worthwhile for him to recreate it. The SBC6120 single-board computer is entirely useable without the optional front panel. It offers a serial console port to which any ASCII terminal or terminal emulator can be attached for complete operation of the SBC6120 board. Please see Bob Armstrong's SBC6120 pages at "Spare Time Gizmos" for all of the details, pricing, availability, timing, scheduling, etc. Please specifically note that all payment must be made through PayPal and that PayPal is the only payment processor Bob Armstrong is able to accept. This is a PDF (http://www.pat2pdf.org/patents/pat7466536.pdf) of the complete EEStor patent, granted on December 16, 2008 which provides a detailed description of the construction and composition of their "EESU" Electrical Energy Storage Units. This PDF file (http://www.teslamotors.com/display_data/TeslaRoadsterBatterySystem.pdf) provides details about the design of the Tesla Roadster's lithium-ion (Li-ion) battery pack, also known as the ESS, or Energy Storage System. Here's a locally sourced PDF of their article if the original link dies. This earlier patent, granted on April 25th, 2006, shows the progress in materials selection and development made over the course of several years. EEStor is not the only group looking into using barium titanate nanoparticles as a capacitor's dielectric. This Georgia Tech article discusses it, and BASF has a pending patent covering their own process. The EEStor patent describes their process of aligning the barium titanate dielectric's field — under the influence of 4,000 volts — to dramatically increase the dielectric's electric field permittivity, and thus the effective energy storage capacitance of the EEStor ultracapacitor. And finally . . . This Pure Energy Systems Wiki page has a large number of additional interesting links about EEStor and their EESU. Set your system's date to Sunday, August 15th, 2004. The fake server certificate has deliberately been made valid only from 7/30/2004 through 9/1/2004. We can be pretty sure that "Equifax Secure Global eBusiness CA-1" NEVER issued and signed the certificate for the domain: "i.broke.the.internet.and.all.i.got.was.this.t-shirt.phreedom.org" . . . yet there it is. We can also be pretty sure that the Equifax folks are not feeling really happy this New Year to have their exploited and exploitable MD5-signed root certificates in every PC in the world! Whoops. After you're through poking around, don't forget to reset your PC's date to today. Under the Tools menu, choose "Internet Options." Select the "Content" tab and click the "Certificates" button. Select the "Trusted Root Certification Authorities" tab. You may find that the "Friendly Name" column provides a more useful and understandable name for the certificates. For example, “COMODO” is much more well known than “AAA Certificate Services”. 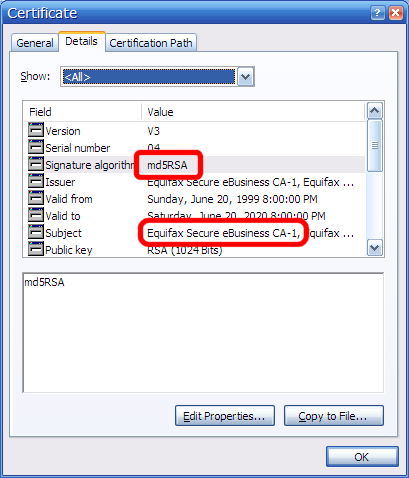 Above, we can see that the Equifax certificate, which has been exploited in the hacker's demonstration, is using the “md5RSA” Signature Algorithm. Fully secure certificates will ONLY be signed using the “sha1RSA” algorithm.